The Web is an extraordinary success, for its simplicity. This simplicity has brought disadvantages, because with vast amounts of information available, the search is a difficult, time-consuming and sometimes inefficient task, creating the need for a strategic information management. To overcome this need came the portals. The characteristics of portals differ from each other, which made them appear different definitions. Also arose several classifications of portals, one of which considers three dimensions to classify them: the scope of content, the aim of the portal and the range of its intended users. With this work, the authors intend to build a Web Portal to support one or more serious games. A database is shared with the Web Portal. This portal will serve to make an interface between the user and the games, for the dissemination and support of these and as a platform for managing and monitoring results. It is true that the Internet has remarkably grown in recent years and, therefore, users feel lost in the midst of such complexity. In the knowledge society we live today, we must have relevant, organized, with quality and easy access information. Therefore it is necessary to make a strategic information management and develop processes to manage the informative chaos of the digital age, so that users can find a way to carry out their researches, with a greater quality, productivity, quickness and profitability. The answer to this need arose in the form of portals that are entry points to the Internet, with directories, news and links to other web sites related to their content. They present a set of important features in the interface allowing the use by people without technical expertise, thereby facilitating the understanding of the system (Warner, 1999; Carani & Nascimento, 2007). Carani and Nascimento (2007) reported that, according to Microsoft Corporation, a portal is, in general, a web site that adds, in a contextual way, information, applications and relevant services. Through a unique interface to meet the needs and interests of the user, the portal provides a direct response to the large variety and complexity of the online world. The quick evolution of technology, following the strong growth of the information, made appear in a few years, numerous portals that have, between them, very different characteristics. 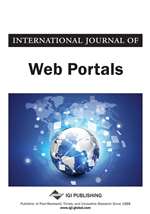 Therefore, several authors have presented different definitions and the terms Portal or Web Portal were used to define a very broad range of types of websites, which can vary from a simple online catalog to complex solutions of the Intranet (Zirpins, Weinreich, Bartelt, & Lamersdorf, 2001).